Competitive bodybuilder, successful model, passionate athlete: Once again Doug P. proves that he is fit in every respect and demonstrates his many skills for numerous new high quality photos and videos here on AllAmericanGuys. The man with the beach muscles: Fitness model Sean H. knows how to build strong arms, pecs, and abs to present an imposingly ripped physique at the sea. You find more high quality photos and videos of Sean H. here on AllAmericanGuys. The most ripped Santa Clause ever with a surprise: This time Ales Zelinka does not only show off his imposing muscles, the competitive bodybuilder presents a special Christmas offer from CzechYoungMuscle: Get two DVDs for the price of one. You can choose any DVDs, and you can combine any titles, even if they contain two discs. This means: If you take two titles - each of them with two discs -, you get four discs for the price of one DVD (39.90 USD). You find this special offer here on CzechYoungMuscle. And even more of Ales Zelinka: New high quality galleries and videos of the successful competitor have been published. You find all of them here on CzechYoungMuscle. When Jessie Godderz reveals how he works his 20 inches guns and builds his heavily muscled physique, his fans are enthusiastic. According to sources at If The World Spins Productions, The Mr. PEC-Tacular Arm & Chest Workout DVD has become such a success that it’s almost reached a major milestone. Over 50,000 copies of the DVD have been sold since its initial launch a few months back. That is nearly unprecedented for Workout/Fitness DVDs in that short of a time period. As a result of the DVD’s unexpected success, it was just re-released and the company has now teamed up with DVD industry leader www.MostMuscular.com to make it available to an even wider international audience (Source: www.tnasylum.com). With DVD sales so strong, the company expects to launch a new Mr. PEC-Tacular Workout DVD this summer right before the next CBS Big Brother season debuts. Godderz is expected to debut on IMPACT Wrestling this spring/summer. 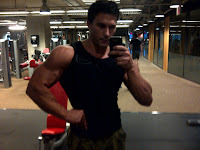 Delicious protein shakes, exceptional exercises, astounding answers to extraordinary fitness questions: There is much activity on Tyler Sarry's Facebook page http://www.facebook.com/​tylersarryfitness where the Canadian fitness model, actor and competitor trainer posts everything which helps his visitors to get in shape: workout videos, meals and recipes, consultation via messages, and photos of himself which show how ripped you can get, if you follow his advice. Tyler: "I believe the best way to promote fitness as a lifestyle is to exemplify it yourself with hard work and dedication that shows. You can have the 'Knowledge' but if your an out of shape, poorly groomed and unmotivated trainer I don't see how that would get any client pumped and motivated to reach their goals. I believe possessing the knowledge as well as looking the role is much more appealing and admirable, which in return shows my clients they can reach their own peak potential, and surpass it with my help." Now Tyler aims at getting 1,000 fans and more on his Facebook page. If he reaches this goal before the new year, he promises "to post my Ultimate Core - 50 advanced exercises - video for you all for free." To show how comprehensive his page is, here is a sample video of Tyler's imposing variety of workout exercises. If you watch these 15 minutes, you already feel fitter. And if you follow these exercises, you are well on the way to actually being fit and ripped. Probably the woman in the background says to her boyfriend/husband: "You could have guns like his, if you only visited his Facebook page." "My name is Ben Booker, and I'm an alcoholic." This is how the bodybuilder and fitness model introduces himself. In this video Ben Booker shares the impressive story of turning his life around from alcoholism to top magazine cover model and the 2010 BodySpace Spokesmodel, and tells how fitness played a major role in saving his life. A better pump, maximum muscle growth, faster results: These are the benefits of reaching absolute failure according to Ben Booker. 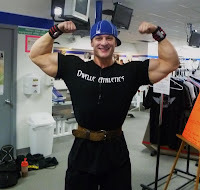 The bodybuilder and 2010 BodySpace Spokesmodel winner explains in this video his philosophy on absolute failure and demonstrates that for his bicep workout. Massive pecs, steely abs, huge arms - an absolutely ripped physique. Anthony G. knows how to use the weights to sculpt his body perfectly. The popular fitness model flaunts the imposing result of his workout for many new high quality photos and videos here on AllAmericanGuys. He delights in building big muscles and is an expert on it. Ryan S. is a competitive bodybuilder and fitness model. 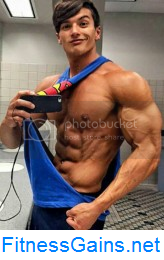 He's competed in several NPC shows and is always looking to perfect his game. Ryan trains several times a week in the gym and is a very health conscious person. One of his ultimate goals is to become sponsored by a major supplement company and to be a role model for new bodybuilders. When not training hard in the gym, Ryan enjoys the outdoors and spending time with friends and family. You find many high quality photos and videos of Ryan S. here on AllAmericanGuys. He is heavily muscled, but not only his physique is highly impressive. Sean H., who was born and raised in Florida, is a natural athlete and played football during high school. His hobbies include fishing, working out, going to the beach, and spending time with family and friends. Modeling is a new endeavor for Sean and he's hoping to make it into a full time career if possible. He's very open to new ideas and wants to stand out from the pack. You find many high quality photos and videos of Sean H. here on AllAmericanGuys. Never too big: Tyler Garceau's arms measure breathtaking 20 inches. In this video the bodybuilder demonstrates his arm routine which consists of a big variety of exercises to make biceps and triceps grow as much as possible. Highlight: At the end of the clip Tyler does 100 curls with no rest. The ultimate workout video for huge arms. Welcome to Tyler's gun show.